Two player Euros are fairly rare and even more rare when they are actually good. The Inland Port provides all the building purchasing, cube pushing, and resource wheel manipulation you expect in a tidy little box. Primary Mechanics are Empire Building, Resource Management, and Economics. Playing a good Euro with 3 or more players is fairly easy but with 2 players, many of these games fall apart. Most 2 player games are often directly confrontational and most Euros are, well, not. 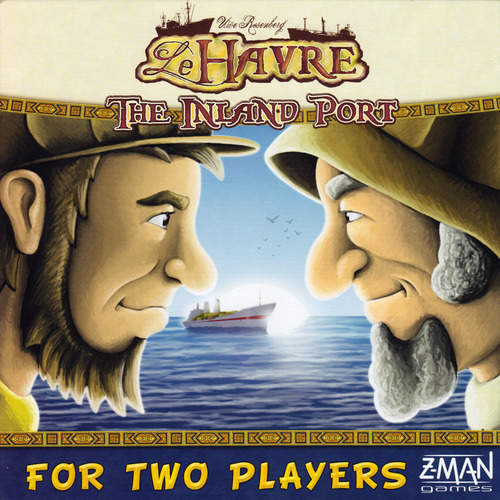 This is one of the reasons why I was interested in giving Inland Port, a two player Le Havre spinoff designed by Uwe Rosenberg, a shot. Inland Port is all about profit while managing four types of resources (Wood, Clay, Grain, and Fish). You’ll track these resources on a warehouse style building with a fairly unique manipulation matrix. This matrix works in 8 directions and limits your mobility. If you move right, you’re adding a single resource whereas moving up, you’re adding 3 of that resource. Because the number of spaces are limited, you have to find ways to maximize your production. For example, if you move right 4 times but only have the space to move twice, the extra movement is lost. Early in the game, this movement is typically horizontal but soon enough buildings are introduced to increase the verticality of your movement. Which brings us to the Buildings. These are small tokens to add to your wheel and open actions up for you. They have a cost, a value (points at the end of the game or a sale value), an action, and possibly a secondary action. Some buildings towards the end of the game have a Lock Symbol which means they offer up no actions and are just points. When you buy a building, you’ll spend the resources and place the building in the 0 space of the wheel. Or you may use a building, resetting its place on the wheel. When all the turns of a phase have been spent, the wheel will move 1 space counter clockwise. If I’m being vague about the wheel, there is a reason as it really needs its own paragraph. This is the production wheel already in use in Ora & Labora as well as The Glass Road. As a mechanic, it’s the hardest thing to understand in this game. When you use a building, you use its primary action as many times as its position on the wheel tells you. The secondary Action, regardless of the buildings position, is used once. The 6 spaces on the wheel are 0, 2, 3, 4, 4c, and Sell. If a building ever enters the Sell space, you immediately lose that building for its coin value. Using a building is the only way to move it and it will immediately go into the 0 space. So at the end of a phase, when the wheel moves, the buildings position stays the same, increasing the number of primary actions that building takes. Of course your opponent can, and likely will, be paying attention to your buildings since they can use them for a minimal cost just as much as you can use theirs. The Locked Buildings I mentioned earlier? They never move (since they have no actions associated with them, you cannot use them as a “pass”) but by the time they enter the game, there is no way for them to enter the Sell space. So I’ve described your two actions, buy a building and use a building. The final bit of information to play the game is simply how many turns you get and that’s all found on the wheel as well. The game has 12 phases, labeled A-L, and they are pictured on each player’s wheel; A-F on Player 1’s wheel, G-K on Player 2’s wheel. Each phase unlocks a new selection of buildings to choose from, comes with a set number of turns, and on your wheel, if there is a sun above the building in the current phase, it means you are the start player for that phase. Each phase has an uneven number of turns so the start player will also be the last player for that round. Because both buying and using buildings reset them to the Zero Space, tracking the number of turns is a simple matter of counting. 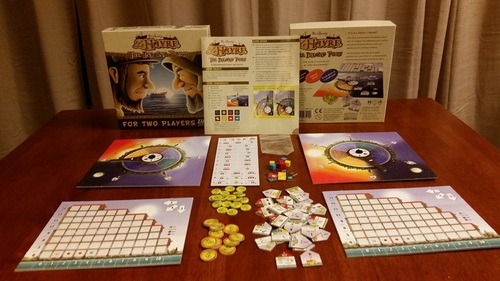 The total number of turns in the game is 72 so each player receives 36. At the end of the game, your left over resources count for nothing (except through the use of special buildings), so it becomes a matter of how many coins you have as well as how many your buildings will sell for to declare the winner. Learning the game isn’t too heavy a task once you figure out food is a duel resource spread across the Fish and Grain markers. The two biggest things to learn in this game are how the resource matrix works and the wheel itself. This may cause a struggle for at least the first half of the game for those who haven’t encountered “the wheel” before or are generally unfamiliar with Euro style board games but the simplicity of the actions make learning the game fairly easy. The difficult part comes in the sheer number of decisions which can be overwhelming. “Do I use the Farm now or wait another turn to really take me through a couple more actions, then again, my opponent is low on Grain and she could take the action just to spite me.” If you could focus on a few things, that would minimize this but you do have to plan several turns ahead and hope your opponent doesn’t do what you wanted. The biggest negative I can give this game is that, typically, only 6-8 buildings last until the end of the game so you’ll know several buildings will be in play. It’s a puzzle that, when facing “that type” of gamer, an efficiency engine could be learned, reducing the replay. But when each play of the game takes about an hour, it could be a good 5-10 plays before a “definitive strategy” could be learned. If you have the same opponent each time, this advantage could be leveled out by skilled players. I wish Zman would release more buildings like All Creatures Big & Small. 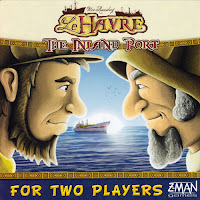 Should also mention I have played Le Havre a couple times and it’s not exactly my favorite game, or even one I would add to my collection, but Inland Port stands as its own experience. They have thematic similarities, but entirely different “puzzles” to solve. 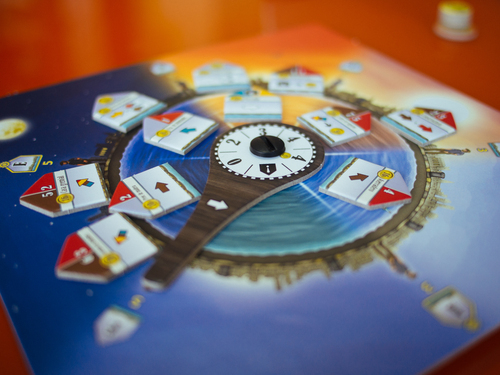 As a 2 player Euro, Inland Port comes highly recommended, especially if you can get it below the $40 MSRP. The variety of decisions to be made ensures a strategic experience for 2 players without the “reduce opponents health to zero” win condition typical of 2 player games.